Get amazing speed, productivity, networking and stunning quality in the HP top wide-format color laser printer. 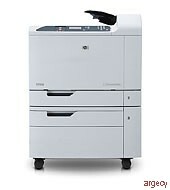 It's dependable, flexible and provides high-volume printing up to 40 ppm. Print marketing materials up to 12 x 18 and banners up to 12 x 36. Power consumption footnote: Values current as of February 2, 2004. Power reported is the highest value measured for color and monochrome printing using all standard voltages.